In many ways, the long and closely followed 2008 presidential campaign has been a boon for all three of the major cable news channels, Fox News Channel, CNN and MSNBC. The cable news networks have devoted considerably more time to the race for the White House than any other media platform and have seen their ratings benefit as well. Given the intense attention to the daily campaign trail, their extensive coverage of primary election nights, the two major conventions, and their sponsoring of primary debates—as well as the diminished coverage of such key moments on the three traditional broadcast networks—cable news has in some ways become the primary medium for politics on television now. as in this campaign further institutionalized the sometimes uneasy hybrid of opinion and reporting. And those opinions are often quite different from one channel to the next. While the concept of “blue truth” and “red truth” in the news media is overstated when one examines the mainstream press overall, the data here clearly show three distinct colors to the news of the presidential campaign on the three main cable channels. Fox, the biggest variance is how much more positive coverage there is of McCain than elsewhere. Which network in the end varied most from the press overall? One way of testing this is to average the statistical difference in positive and negative coverage for the two presidential candidates. Doing, this Fox varied from the press overall by 40%, and MSNBC by 30%. In the 2008 election season, MSNBC, the perennial third-place finisher in the cable news ratings race, unveiled a new approach—positioning itself in prime time as a leftward-leaning analog to the Fox News Channel. That personality became arguably even clearer in the general election season with the arrival of Air America radio talk show host Rachel Maddow as anchor of the 9 p.m. program following Keith Olbermann. The editorial approach is manifest beyond just who is sitting in the anchor chair or getting the last word. When it comes to the tone of the segments and stories about candidates overall, MSNBC was more favorable and, even more clearly, less critical of Barack Obama than the press generally. It was also clearly more negative about both John McCain and Sarah Palin. 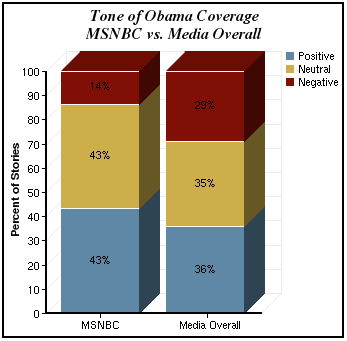 In all, only 14% of stories studied about Obama on MSNBC carried a clearly negative tone, less than half the total in the media generally (29%). The percentage of positive stories on MSNBC about Obama, 43%, was also higher than the press generally (36%), but not as strikingly. And 43% were neutral compared with 35% in the press overall. Conversely, McCain’s coverage was more critical on MSNBC than in the press overall, not to mention any other cable news outlet. Fully 73% of the McCain stories were negative compared with 57% in the press generally. The difference on the positive side was less pronounced. In all, 10% of McCain stories were positive, compared with 14% in the press generally. Put another way, on MSNBC, negative stories studied about McCain outweighed positive ones by a ratio of more than 7 to 1. Joe Biden, meanwhile, received considerably less attention than the other three candidates, and although most of his coverage was mixed, negative outweighed positive by about 2 to 1. One example of how MSNBC’s coverage differed from that of its two competitors was during the period from Sept. 8-14. At that point McCain was enjoying a post-convention bounce that had vaulted him into the lead in most national polls. The media generally were also focused on Palin’s ability to energize the Republican base. 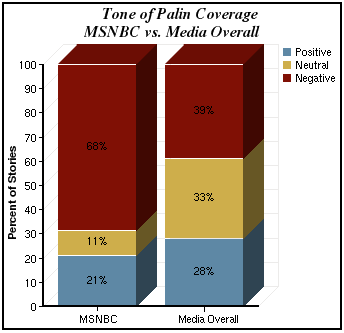 But that week on MSNBC, McCain and Palin’s narratives were more negative than positive (for Palin overwhelmingly so) while Obama got more positive coverage overall. In many ways, the data offer hard evidence to confirm the notion that, at least when it comes to politics, MSNBC is now a counterweight, or leftward leaning alternative, to the tone of coverage seen on another cable channel, Fox. 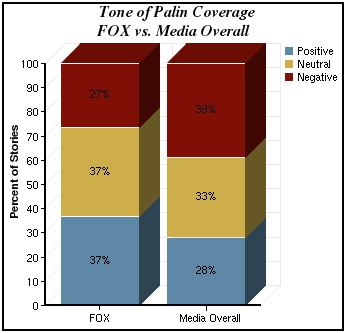 On the Fox News Channel, the coverage was both more negative toward Obama and more positive toward both McCain and Palin than we found in the press generally. 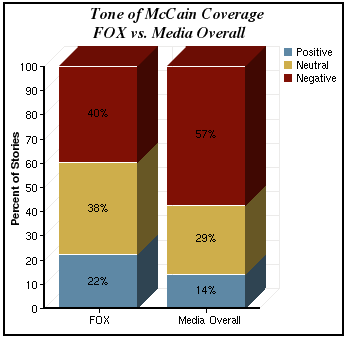 That said, coverage of McCain was still more negative than positive on Fox News by a factor of roughly 2 to 1. When it came to McCain, 40% of stories studied on Fox about the Republican nominee were clearly negative (compared with 57% in the press generally). Meanwhile, 22% of stories were positive, compared with 14% in the press generally. 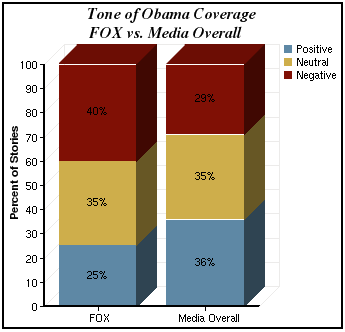 For Obama, Fox was both less positive and more negative than the press generally or than any cable rival. In all, 25% of Obama stories studied were positive on Fox, compared with 36% in the press overall. And 40% of stories were negative, compared with 29% in the press generally. Fox looked much more like other outlets in the percentage of stories that were mixed or neutral, 35% on Fox and the press overall both. or mixed, compared with 33% overall. Joe Biden, as in other outlets, received limited coverage on Fox and it ran more than 2 to 1 negative. There are a few aspects of candidate coverage that highlight Fox’s differences with other outlets. One occurred the period from Sept. 15-23, when the impact of the economic meltdown on Wall Street was becoming clear and the political playing field began to shift toward Obama. On Fox, the assertions about the Democrat that week were much more negative (55%) than positive (15%). If MSNBC and Fox offered rough mirror images of each other, the tone of CNN’s general election coverage stood somewhere in the middle. While the other two cable networks feature openly ideological hosts, CNN relies on a formula in which its prime time anchors—most notably Wolf Blitzer and Anderson Cooper—try to operate as non-partisan brokers. But it doesn’t mean the network lacks opinions. Indeed one thing that stands out in CNN’s coverage is that more of the opinions expressed (whether by CNN staff or outsiders) on the channel were negative in tone than not. And CNN is the only one of the three cable news outlets studied in which all four candidates generated more negative than positive coverage. 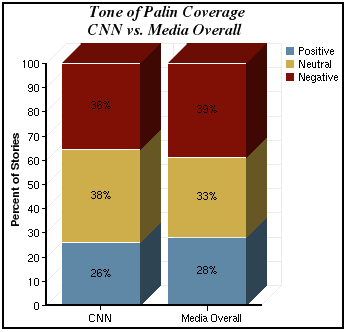 Coverage of Barack Obama, for instance, was mixed and slightly more negative than positive, a contrast with the media overall. In all 36% of the Democrat’s stories were positive, identical to the media generally. But 39% of Obama stories studied were negative, a full 10 percentage points higher than found in the press overall (29%). That made Obama’s coverage on CNN less negative than on Fox and less positive than on MSNBC. 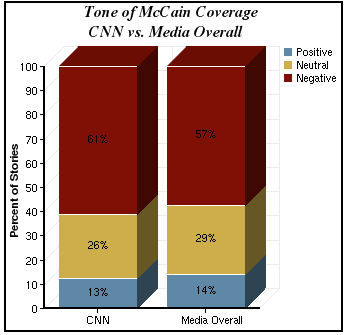 The tone of CNN’s coverage of McCain was also mainly negative. Stories about McCain were more than four to one negative (13% positive, 61% negative and 26% neutral.) That was very close to the media generally (14% positive, 57% negative and 29% neutral) and fell somewhere between its two competitors. The same overall pattern held with Sarah Palin. On CNN, she garnered 36% negative coverage versus 26% positive and 38% neutral, again very close to the press generally (28% positive, 39% negative and 33% neutral). The Alaska Governor generated more positive attention on Fox and more negative coverage on MSNBC. Biden had the lowest level of coverage and it was more negative than positive. Perhaps the aspect of campaign coverage that most distinguished the cable news sector was the sheer volume of attention paid to the presidential race. Fully 60% of all the cable news airtime examined in this report was devoted to the 2008 election. Overall, the percentage of newshole devoted to the campaign in the media generally was far less—only 38%. And no other sector came close to cable’s level of interest in the race. A look at the components of that extensive coverage reveals a few counter-intuitive findings about a medium that, on the surface, might seem to dwell heavily on the strategy and tactics of the race and the high-tech electoral maps. 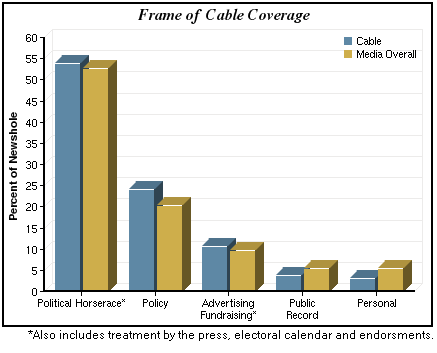 In terms of the frame of coverage, cable’s overall attention to the horse race elements of the campaign (54% of the newshole) was virtually the same as the overall percentage for all media sectors (53%). And in fact, cable spent a slightly higher percentage of its time (24% of newshole) on policy issues than the media overall, which devoted 20% of its newshole to policy debates.